he 187th Infantry Regiment was constituted on 12 November 1942 at Camp Mackall, North Carolina. 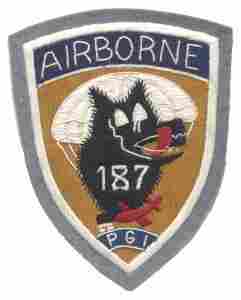 On 25 February 1943, the 187th was activated. designated a glider regiment, and assigned to the 11th Airborne Division. A two battalion regiment, 187th trained and prepared for combat with its men trained at the end of the war both as gliderists and parachutists. In May 1944, the Regiment deployed with the Division to the southwest Pacific debarking at Lae, New Guinea. On November 18th, the entire 11th Airborne Division landed on Bito Beach on Leyte. Four days later the 11th relieved the 7th Infantry Division. Initially, the 187th under Colonel Harry D Hildebrand (picture left) were charged with guarding the rear installation around Bito Beach. However, in the ensuing days the Japanese mounted their only airborne operation against US forces in WW II an jumped on the San Pablo airstrip on Leyte. General Swing immediately ordered a counterattack and rushed the 187th forward from Bito Beach. During the battle the 1st Battalion of the 187th captured the Japanese paratroopers flag which hangs today in the West Point Museum. 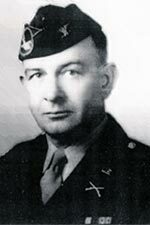 Meanwhile, the 2nd Battalion of the 187th under the command of Lt Col Arthur H Wilson Jr reinforced the 511th. Two days after Christmas the 187th moved to attack the Japanese positions at Anonang on two steep parallel ridges. The second ridge became known as Purple Heart Hill because of the large contingent of glidermen killed and wounded while taking it. After two days of ferocious fighting the ridge was seized. In January 1945, the 187th landed with the Division at Nasubu Bay, south of Manila to seize Tagaytay Ridge and to advance on Manila from the south. From January to April the 187th was in constant action, ranging from Nichols Field, Fort McKinley and Manila to Mount Macolod and Malepunyo. In May, the Regiment moved into Lipa to refit, rebuild, and prepare for (he Invasion of Japan. At this time, the 3rd Battalion was formed and the Regiment was redesigned a para-glider regiment. When the war ended, the 187th was selected to spearhead the occupation of Japan and gained the distinction of being the first foreign round combat unit to enter Japan. While serving as occupation forces, the 187th received the title "Rakkasan" from the Japanese which literally translated means "Falling Down Umbrella". In April 949, the Rakkasans returned to the United States with the 11th Airborne Division and settled into then Camp Campbell, Kentucky. In early 1950, the Rakkasans participated in the largest peacetime airborne maneuver in history, "Operation Swarmer". The Performance of the Regiment during this maneuver was instrumental in the Regiment being selected to form an airborne regimental combat team to enter the Korean conflict.